By default, Windows displays the local time and date on the right side of the taskbar. Clicking on the time/date will bring up a calendar displaying the current month and date, and the image of a clock showing the local time. What if you would like to send a message to a relative in another time zone and would like to know if it's too early⁄late to contact them? It's extremely easy to add an additional clock to the calendar/clock display. 1. 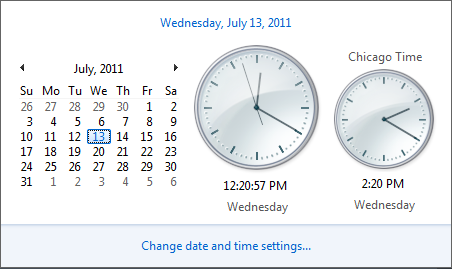 Click on the time/date on the right side of the taskbar to display the calendar⁄clock display. 3. In the Date and Time dialog box that appears, click on the Additional Clocks tab. 4. On the Additional Clocks page, set the  Show this clock checkbox. 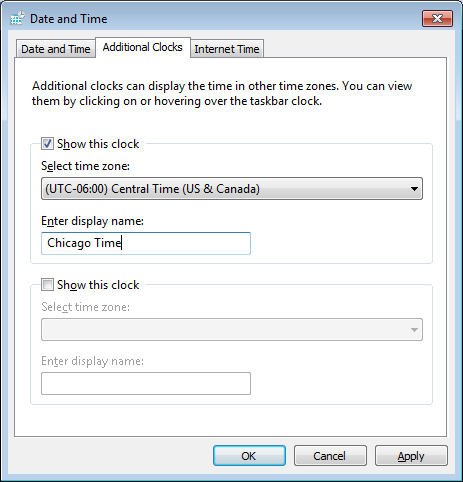 Select a time zone in the Select time zone: drop-down list. Type a name for the clock in the Enter display name text box. You can add up to two additional clocks. (along with the local time clock). I you need more than two additional clocks, check out Desktop Gadgets. You can add as many Clock gadgets to the desktop as you like, and set the time of each accordingly.